A quality building of style typical of those you find in the alpine region of Klosters. The apartment is very light and spacious with new solid oak floors and stripped wooden doors. 2 large bedrooms, one with a kingsize double bed, the other with specially carved beds giving 2 large single beds. There are 2 normal single beds above these which allow 2 extra people. The main bathroom which is ensuite to the double bedroom has bath, washbasin, and wc. The other bathroom has a large shower, washbasin and wc. The kitchen has a fan oven, microwave, glass ceramic hob, extractor fan, dishwasher, fridge with freezer compartment, filter coffee machine, toaster, fondue set, kettle. The kitchen and two bathrooms have been newly fitted to a high standard. The living and dining room has a stripped wooden ceiling which together with an open-log fire gives a traditional mountain ambience. Widescreen TV, DVD and music system together with wireless internet access. We are 100% satisfied with our stay at this apartment: it is beatiful, cozy, very high standard, clean and well equipped. Outstanding communication with the owners by phone, e-mail and in person! Thank you! Klosters, with a total area of 19,303 ha, lies in the south east of Switzerland and consists of seven parts - Klosters Platz, Klosters Dorf, Selfranga, Aeuja, Monbiel, Serneus, Mezzaselva. The village of Klosters lies around 1200 meters above sea level, whilst its higher neighbour Davos is the largest mountain holiday resort in the Alps and with the fast tunnel connection to the Engadine valley, Klosters has magnificent opportunities for families seeking active holidays. 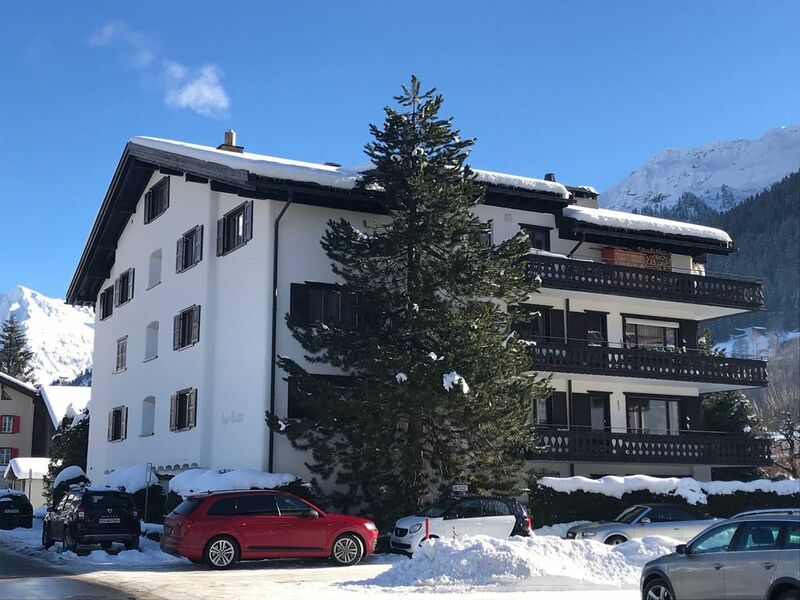 The apartment is in the heart of Klosters Platz opposite the Sports Centre. Restaurants and shops are very close by. The kids snowgarden is within 100m, floodlit skiing at Selfranga 200m and the famous Gotschnabahn cable car 500m. You can ski back to the apartment on piste number 49 to within 100m of the front door. From the large balcony that faces south and west, there are wonderful unbroken views of the surrounding mountains. For local buses, there is a stop right by the apartment. Endreinigung: SFr.100.- Wäsche: SFr.15.- pro Person Gästetaxe Klosters pro Person/Nacht: Hauptsaison SFr.4.50 / Zwischensaison SFr.2.60 Kinder ab dem 6. bis zum 12. Geburtstag zahlen die Hälfte. Kinder bis zum 6.Geburtstag sind gratis! Mai und November gelten vollumfänglich als Nebensaison!